The commissioners created the township of Trondhjem on July 7, 1873, and so named it at the request of the petitioners, practically all of whom were Norwegians. The first election was held on the 25th of the same month at the house of a man by the name of Petersen. The town­ships of Norwegian Grove and Oscar had both been organized this same year, the former at the January and the latter at the July session. These three townships, as their names indicate, were settled by Norwegians. The petition organizing the township was dated March 25, 1872, and contained the following names: H. O’Grina, Sivert O. Hammer, Theodore Tollovoson, Ole M. Tommerness, Nils Olsen Hagen, Hans O. Lunder, Ole L. Loger, Stasius Nordgaard, Lous A. Velo, Anders Larson, Gulbrand Larson, Anders Jorgenson Satrang, Lars E. Bilden, Christoffer E. Warre­rud and Iver Wateerud. 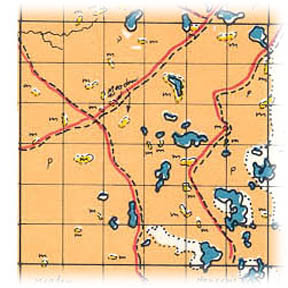 Trondhjem township has more than a score of lakes, none of which are more than a half section in size. The eastern part of the township drains into the Pelican river, while the western part is drained by the tribu­taries of Buffalo river. The township is comparatively level, with practi­cally no land which cannot be cultivated. The soil is very fertile and yields bountifully year after year without the necessity of using fertilizers. Probably the first blacksmith shop in the township was the one located in the southwestern corner of section 17. The first church stood in the southeastern corner of section 9. The only postoffice in the township was at Stod, but it was discontinued in 1905, upon the introduction of rural free delivery from Pelican Rapids. It stood in the eastern part of section 9. Rothsay, in Wilkin county, section 30, adjoins Trondhjem township. In March, 1916, O. F. Juvrud announced that he would plat some ground in Otter Tail county just east of the Nordlie property. His object is to place the lots on the market as soon as possible and it is thought that it will be but a short time before the corporate limits of Rothsay will be extended to include a strip of land in Otter Tail county. There are already a number of houses on the Otter Tail side. Places of birth for Trondhjem Township in the 1905 state census.